Nuer General Gabriel Tang: South Sudan’s Prodigal Son or Khartoum’s Agent of Chaos? In the aftermath of the successful vote for independence, South Sudan’s government now finds itself faced with several rebel militias, tribal violence and clashes between gunmen in oil-rich Jonglei state, South Sudan’s largest. Prominent among the rebel generals threatening the unity of South Sudan as it approaches full independence in July is Major General Gabriel Tang (a.k.a. Gabriel Gatwich Chan Tanginya, i.e. “Long Pipe”), aNuer tribesman from Jonglei’s Fangak county. Though he began his career as a separatist rebel, General Tang has long been known as a Khartoum loyalist. Today General Tang is a Southern warlord of uncertain loyalties following a recent series of professions of loyalty to the Government of South Sudan (GoSS) interspersed with a series of armed revolts carried out by his followers, the Tangginyang. General Tang’s future direction will play a crucial role in the development of South Sudan’s massive oil potential, its only important source of revenue and the key to the incipient nation’s success. Tang’s differences with the Sudan People’s Liberation Army/Movement (SPLA/M) and its late leader Colonel John Garang date back to 1983-84, when the Anyanya II movement came into conflict with the newly-formed SPLA which had renewed the rebellion against Khartoum. Many in the Nuer militias of Anyanya II rejected what they viewed as a Dinka-dominated SPLA leadership. By 1984, Khartoum began to exploit these divisions, providing arms and funds to a more formally organized “Anyanya II” under the leadership of Nuer leaders such as William Abdullah Chuol and Paulino Matip Nhial. The hope was that this militia would help secure the oil fields of Jonglei, but as the Anyanya II enjoyed only limited support amongst the Nuer, the result was a bitter conflict between Nuer militia members and Nuer forces under the SPLA banner. The Anyanya II were successful in disrupting SPLA supply routes and attacking columns of SPLA recruits headed to Ethiopia for training, but by 1988 most of the movement had decided to join the SPLA. Those remaining hostile to the SPLA, including Gabriel Tang, began to be more closely integrated with Sudan’s military intelligence and regular army. The SPLA suffered a devastating split in 1991 when three senior commanders, Riek Machar, Gordon Kong Chuol and Lam Akol, announced the overthrow of John Garang as the movement’s leader. In practice, however, Garang remained in the field with substantial forces under his command and the following decade witnessed a brutal civil war within a civil war between Garang’s SPLA-Mainstream (a.k.a. SPLA-Torit) and Riek Machar’s SPLA-Nasir faction. As Riek Machar’s pro-Khartoum tendencies became clearer (they were eventually sealed in a 1998 agreement with Khartoum), SPLA-Nasir began to splinter and once again there were numerous clashes between different Nuer factions. Following Riek Machar’s 1998 agreement with Khartoum, his forces were renamed the United Democratic Salvation Front/South Sudan Defense Force (UDSF/SSDF). A clear Khartoum loyalist by now, Tang became a leading commander in the SSDF with a close association to the SAF. After the 1998 agreement, SSDF figures such as Riek Machar and Gabriel Tang were commonly seen in Khartoum. Even after Machar’s 2002 reconciliation with John Garang and SPLA-Mainstream, Tang remained a pro-government militia leader. The SSDF became so closely identified with Northern interests that it was not allowed to be an independent party to the Comprehensive Peace Agreement (CPA) talks on the grounds the movement had become synonymous with Khartoum. General Tang’s most notorious campaign took place in the Shilluk tribal lands of the Upper Nile in 2004. The origin of the violence dated back to 1991, when Shilluk leader Dr. Lam Akol broke away from the SPLA to form the ironically-named SPLA-United. 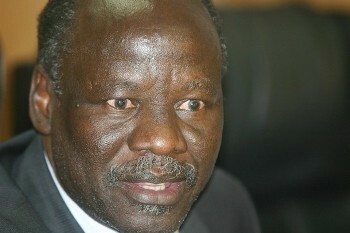 Fighting between the SPLA and the breakaway group continued until the Fashoda Peace Agreement of 1997 landed Lam Akol’s movement firmly in the pro-Khartoum camp. When Akol rejoined the mainstream SPLA in August 2003, Khartoum took steps to bring the Shilluk country in Upper Nile back under government control. Pro-Khartoum Shilluk militias were joined by SAF gunboats and pro-Khartoum Nuer militias under the leadership of General Tang, General Paulino Matip and Tang’s lieutenant, Thomas Mabor Dhol in an offensive along the west banks of the Nile and Bahr al-Ghazal rivers, attacking the village of the Shilluk king, among others. Shilluk communities were devastated with large loss of civilian life and tens of thousands displaced (Sudan Vision, March 13; IRIN, March 13, 2004). Tang’s efforts were rewarded with a promotion to Major General in the SAF. When many Nuer leaders of pro-Khartoum militias went over to the SPLA in 2006 after signing onto the Juba Declaration, Tang remained in the Khartoum camp, unwilling to associate with the Dinka commanders in the SPLA that he believed intended the subjugation of the Nuer. After a dispute between the SPLA and the Tangginiya, shooting broke out in Malakal (capital of Upper Nile state) with both sides claiming the other had fired first. The SSDF accused Salva Kiir and Riek Machar of engineering an “assassination attempt” on “SSDF Chief of Operations, Major General Tang” that began with an assault on Tang’s Malakal residence (SSUDA-SSDF Press Release, March 29, 2009). The dispute turned into a pitched battle, with Tang’s force falling back on a barracks close to the Malakal airport (Reuters, December 2, 2006). After three days of fighting and looting that had scattered bodies in the streets and left Malakal without a water supply, GoSS president Salva Kiir cut short an official visit to Uganda to return to South Sudan (New Vision [Kampala], December 1). Malakal residents began to draw water directly from the Nile, which was contaminated with dead bodies, furthering a local outbreak of cholera (Reuters, December 2, 2006). Leaving thousands of local residents displaced or in mourning, General Tang returned to the safety of Khartoum. Under the terms of the 2005 CPA, Tang had the option of aligning his men with either Khartoum’s SAF or the Southern SPLA. After opting for the former, Khartoum decided to send Tang’s fighters south as part of the Northern component of the newly formed Joint Integrated Units (JIU). Given Tang’s history in the region, Khartoum’s decision to deploy Tang in his regional home capital of Malakal could be described as somewhere between mischievous and provocative. In mid-November, 1942, General Erwin Rommel’s Afrika Korps ran out of fuel in the midst of the battle for eastern Libya. An Italian naval convoy carrying fuel to Benghazi turned back rather than risk entry into the harbor. Though sporadic fuel supplies continued to arrive by air and sea, it was not enough, and the once feared but now isolated Afrika Korps entered a swift decline, eventually surrendering to Allied forces in May 1943. Unlike Rommel, however, Libyan leader Mu’ammar Qaddafi does not need to seize and hold territory in the desert, thus eliminating worries about extended supply lines. Occasional raids by small mobile groups are sufficient to prevent the rebels of Benghazi from making new shipments of oil that will fund their revolt. If the Libyan revolution must be funded entirely out of the pockets of Western taxpayers, it will become increasingly hard to sell in countries such as the UK where substantial cuts are being made in all sectors of government, including the military. Such raids may also dry up fuel supplies for the lone rebel-held refinery, which in turn will be unable to supply the gasoline-powered turbines that run Benghazi’s energy plant. So long as the regime can operate with a free hand in the desert, time is clearly on Qaddafi’s side in this conflict. Perhaps conscious of this, the NATO bombing campaign seems to have taken on a new tone of urgency, with strikes on Qaddafi’s Bab al-Zawiya compound in Tripoli designed to eliminate the leadership in hopes of bringing a swift end to the conflict. The arrival, off the Libyan coast, of the French amphibious assault vessel Le Tonnerre with 16 military helicopters may also mark a new phase in NATO efforts to bring the war to an end (Le Figaro, May 22). Of course, this still leaves the vast majority of Libyans who, even if they oppose Qaddafi, have no wish to be ruled by the Benghazi–based clique that a few Western countries have already recognized as the legitimate government of Libya. In one way, the imposition of a no-fly zone actually helped the Libyan regime by forcing it to abandon fuel-consuming armor and aircraft in favor of lighter and highly mobile vehicles that use far less fuel and are difficult to identify from the air. Though Qaddafi began the war as a modern “Rommel,” reliant on conventional armor-based forces, he has been forced to adopt the methods of the long-range desert raiders of World War II, a proven formula in desert warfare. In this, his commanders may be able to apply the bitterly-learned lessons of the 1987 “Toyota War” in Chad, where, like the Italians before him, Qaddafi’s heavy forces were rolled up by highly mobile and lightly armed fighters striking out of the desert on light trucks. The defeat of Rommel took place at sea as well as on land, with Allied ships and aircraft intercepting an increasingly larger proportion of the fuel tankers sent to resupply his petrol-thirsty army. As Rommel noted: “In attacking our petrol transport, the British were able to hit us in a part of our machine on whose proper functioning the whole of the rest depended.”  Qaddafi continues to receive fuel from Italy and elsewhere, shipped through third parties in Tunisia (Guardian, May 5; The Peninsula, May 21). Unless this flow can be cut off, it will continue to be difficult to bring the regime’s mobile forces to a standstill. 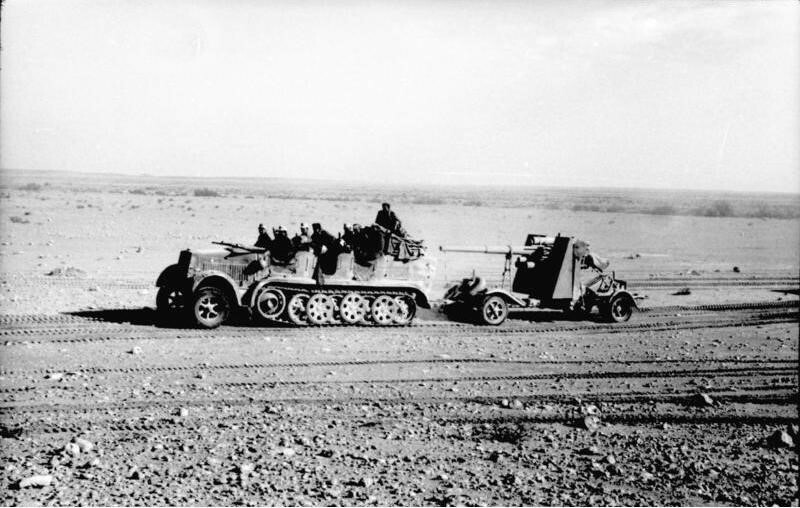 The idea of creating small, mobile attack and reconnaissance groups using specially modified vehicles was devised by Major Ralph Bagnold, one of a number of British officers stationed in prewar Egypt and Sudan, who used their off-duty time to explore the vast Libyan Desert in stripped-down civilian vehicles. Bagnold and his colleagues trained a small but disparate group of volunteers from New Zealand, Rhodesia and various British Guards and Yeomanry regiments in the techniques of desert driving, navigation and warfare as part of the newly formed Long Range Desert Group (LRDG). Besides providing invaluable intelligence, the LRDG mounted raids in conjunction with the Special Air Service (SAS) designed to destroy enemy airfields and petrol dumps, occasionally fighting battles with their Italian counterparts in La Compania Sahariana de Cufra. In 1941, the LRDG joined Free French forces, including Senegalese and Chadian (Tubu and Sarra) colonial troops under General Leclerc, in a daring 850 km raid from the Chadian oasis of Faya Largeau on the strategically located Kufra Oasis in southwest Libya. The Italians had thought such a raid impossible, and the loss of Kufra and its airfield was at once both a crippling blow to Italian communications with its East African empire and a resounding demonstration of the abilities of motorized attack forces in desert warfare. Lessons learned here were later applied in the “Toyota War” of 1987, in which largely Tubu forces under Hissène Habré (with French logistical support and the covert assistance of French Foreign Legion units) drove the Libyan army out of northern Chad, seizing the Libyan’s main base at Faya Largeau, despite being outnumbered and outgunned. Since that time, Kufra’s strategic importance has actually grown as it provides a controlling position over the vast oilfields of eastern Libya, and is a vital point on the Libyan-built desert road system connecting Libya to Chad and Darfur. 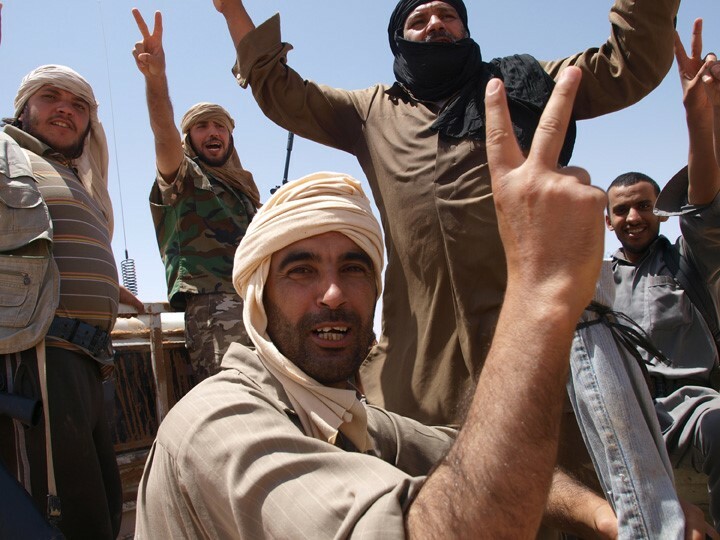 In late April, a column of roughly 250 Libyan loyalist fighters crossed nearly 1,000 km of desert from Sabha to Kufra, taking the oasis after a brief firefight with rebel forces there. So long as Kufra remains in loyalist hands, there is little chance of the rebels restarting oil operations in eastern Libya. Desert raids have enabled Qaddafi to cripple the long-term prospects of the rebellion quickly, decisively and at little expense. Operating out of the Waha oil field or the military base at Sabha Oasis (home of loyalist Magraha tribesmen), Qaddafi’s raiders carried out a series of long-range operations in early April that struck the Misla and Sarir oil fields, targeting storage tanks and pipeline pumps. The targeting appears to have been carefully calculated; the damage could be easily repaired under normal conditions, but the skilled workers in the oil fields have been evacuated leaving no-one to make repairs. The rebels do not have the manpower to defend infrastructure and pipelines stretched over hundreds of miles of desert, so in this way Qaddafi has brought rebel oil production to a halt without causing permanent damage to facilities he would like to retain and return to production in the event of a victory or negotiated settlement. Should these prospects dim in the coming months (or years), more permanent damage can be easily inflicted. Aware of their inability to protect the oil fields, the rebel leadership has demanded that NATO do it for them, a task not easily done from the air. With the sanctions in force against government oil sales, Qaddafi’s greatest advantage is that he does not need to hold the oil fields or even conduct regular raids—the mere threat of such operations is enough to keep the oil fields inoperative. The raids have prompted an announcement by the rebel-operated Arab Gulf Oil Co. (AGOCO) that oil production will not resume until the war is over. According to AGOCO information director Abdeljalil Muhammad Mayuf: “Everything depends on security. We can produce tomorrow, but our fields would be attacked. We cannot put an army around each field. We are not a military company and the forces of Qaddafi are everywhere” (AP, May 15). For now, the lone rebel-held refinery in Tobruk is receiving only the oil that was already in the pipeline before the attacks as it slowly trickles through by gravity, the booster system that normally pumps oil through the pipeline having been badly damaged in an April 21 raid by loyalist forces. The oil inside Tobruk’s storage tanks is not available for export, being needed to power desalinization plants and Benghazi’s diesel-fuelled hydro-electric plant, which is now running at three-quarters capacity to save fuel. This supply is expected to last only a few months before, in true “coal to Newcastle” fashion, the rebels will need to start importing oil as well as the gasoline imports it already relies on (Reuters, April 23; NPR, May 15). Benghazi’s energy plant used to be run by natural gas from Marsaal-Burayqah (a.k.a. Brega), but this city is now in loyalist hands. Keeping the desalinization plants running is crucial in case Qaddafi cuts fresh water supplies from the “Great Man-Made River” project, which taps extensive reserves deep under the Libyan Desert. If that were to happen and the desalinization plants fail, rebel-held territory would also depend on foreign shipments of fresh-water to survive. The rebels’ lone sale of oil was expected to bring in $129 million, but $75 million of this total was needed immediately to pay for a single shipment of gasoline (Reuters, April 23). Yet, instead of rationing precious gasoline supplies, the rebel administration has actually lowered the already low subsidized price, encouraging young men to use the scarce fuel to race their vehicles in pointless displays of bravado better saved for the frontlines (NPR, May 15). The Tripoli government, by comparison, is being far more careful in its distribution of gasoline, even at the risk of inflaming the public. Supplies available to civilians are short, as are tempers at fuel stations that can have waits of several days. Libya’s own refining capacity has always been limited, though efforts are underway to increase capacity at government-held refineries at Ras Lanuf and Zawiya (Guardian, May 5). Residents of Tripoli recently attacked a bus carrying foreign journalists with knives and guns—such buses are given priority at petrol stations (Reuters, May 22). Fuel purchases are being further complicated by a growing shortage of currency on both sides of the conflict as consumers hoard cash and banks limit withdrawals—a major shipment of new British-made bills is being held up by sanctions, though its military use is disputable. In terms of real funds, however, Qaddafi is well supplied with foreign reserves (estimated at $100 billion, much of it beyond the reach of sanctions) and a large store of gold that continues to appreciate, due, in part, to the instability in Libya. NATO has begun interdicting fuel shipments to government-held ports in Libya under the “all necessary measures” clause of UN Security Council Resolution 1973, designed to prevent the killing of civilians by the Libyan regime. On May 19, NATO forces boarded the Jupiter, a tanker carrying 12,750 tonnes of gasoline from Italy in Libyan waters, ordering it to anchor off Malta. Another vessel, the Cartagena, was reported to be on its way to Zawiyah with a load of 42,000 tons of fuel from Turkey (Petroleum Economist, May 19). The rebel Transitional National Council (TNC) has asked NATO to prevent all fuel shipments from reaching government ports, but stopping tankers in Libyan or international waters is of questionable legality under international law. Of course, there is no guarantee that the mercurial Libyan leader will take advantage of the opportunities now presented to him. Yet, those supporting the Benghazi rebels should be aware that the initiative still lies with Qaddafi should he choose to shift his efforts from the now static coastal campaign and exploit the desert option. While the rebels consist largely of urbanized Arabs from towns and cities along the Mediterranean coast, Qaddafi may call on experienced desert fighters from the nomadic Arabs of the interior as well as fighters from the Tuareg and Tubu groups, long recognized as established masters of the desert. NATO currently faces a shortage of refueling and long-range surveillance aircraft in the Libyan deployment that would help secure the vast Libyan interior. Rebel planning to deal with difficulties in the south is complicated by internal divisions within the rebel leadership, a lack of trained men and the general reluctance of defecting troops to participate in frontline operations. In this environment, Rommel’s observations on the importance of petrol as a decisive factor in campaigning in the Libyan Desert are as relevant today as they were in 1942. 1. Erwin Rommel (ed. by Sir Basil Henry Liddell Hart): The Rommel Papers, 15th ed., New York, 1953, p.359. 3. See Andrew McGregor, Jamestown Foundation Special Commentary on Libya: “It Didn’t Start This Way, but it’s a War for Oil Now,” April 20, 2011. 4. An excellent account of the Guards units in the LRDG can be found in Michael Crichton-Stuart, G Patrol, London, 1958. 5. See Andrew McGregor, “Qaddafi Loyalists Retake Strategic Oasis of Kufra,” Terrorism Monitor Brief, May 5, 2011. 6. See Ralph A. Bagnold, Libyan Sands: Travel in a Dead World, London, 1935. 7. The Tubu of southeastern Libya and northern Chad have a fearsome reputation as desert warriors. According to Bagnold: “For many years, perhaps for centuries, raids had been made by the black Tubu hillmen of the western highlands into nearly every region bordering on the South Libyan Desert. Their movements were unknown. They operated in places as far apart as the Nile Valley and French Equatoria, Darfur and the oases on the Arba’in Road. How they operated across such vast distances of desert no one could tell. The raiding parties were small and extraordinarily mobile; their seeming indifference to water supplies undoubtedly stimulated the general belief in the existence of undiscovered wells away out in the desert.” Libyan Sands, pp. 238-239. For several years now, Mogadishu’s densely populated and labyrinthine Bakara Market has served as a stronghold for local al-Shabaab militants as well as provided a major source of revenues for the movement through donations, extortion and “taxation.” A continuing offensive by Ugandan and Burundian troops belonging to the African Union Mission in Somalia (AMISOM)—supported by soldiers of Somalia’ s Transitional Federal Government (TFG) and the Sufi Ahlu Sunna wa’l-Jama’a militia—has now penetrated the southern and western boundaries of the market. While the battle for Bakara will undoubtedly present all the difficulties of urban warfare, its conclusion will play a large role in determining the future of both the rebel Islamist movement and the struggling TFG. At a time when the people of Mogadishu are recovering from the severe droughts that had crippled much of the country in the recent months, and started rebuilding their shattered lives, the African crusaders embarked on a brutal campaign to demolish everything the innocent civilians have thus far managed to construct… Lured by greed and an opportunity to pillage and plunder the wealth of the civilians, the apostate militia [i.e. TFG forces], aided by the tanks and artillery of the African crusaders, launched an offensive on Bakara Market, where tens of thousands of civilians gather every day to earn their living. And as the people went about their usual businesses, the militia raided them with mortars, shells and bullets, specifically targeting large companies, hotels, warehouses and stores, and indiscriminately killing dozens of innocent civilians (Press Office of the Harakat al-Shabaab al-Mujahideen, May 24). The Bakara Market is an important source of food, clothing and arms for local Somalis. The TFG is intent on ending the latter trade, which offers everything from assault rifles to anti-aircraft guns. In 1993, Bakara was the scene of fighting between Somali militias and U.S. forces, and in 2007, a major fire was started during combat between Ethiopian troops and fighters of the Islamic Courts Union (ICU). As AMISOM forces tighten their grip on the approaches to the market, AMISOM commander Major General Nathan Mugisha has issued an appeal to local residents to “minimize unnecessary movements within the Bakara market area to avoid being caught up in crossfire” (Horseed Media, May 12). Shabaab fighters are digging trenches to prevent the entry of tanks or other military vehicles. Shortly after the latest operation was launched on May 12, AMISOM forces reported killing Abdufita Muhammad, the Shabaab commander in the Bakara market, his intelligence officer Abdiwahab Shaykh Dole and two Pakistani mujahideen identified as Hussein Abassi and Abdullahi Yalb (SUNA Times, May 15). The struggle for the market has also led to civilian casualties, though both sides deny shelling civilians. A mortar round fired at a women’s clothing market killed at least 14 people on May 18 (AFP, May 18). An AMISOM spokesman said the mission has “designated Bakara market a ‘no-fire’ zone and does not fire artillery or mortars into the market. We know that the extremists, who extort money from the businesses, have established a stronghold in the market and deliberately shield their reign of terror behind the civilians and business community who make their living there” (Horseed Media, May 21; AFP, May 20). The fighting is reported to have claimed 50 civilian lives and wounded 100 others in the period of May 22 to May 24 (Mareeg.com, May 24). In a sign of confidence in AMISOM gains in Mogadishu, AMISOM has begun relocating its civilian staff and police element to Mogadishu from Nairobi, where they have been based since 2008 due to instability in the capital. The TFG has also promised to establish a police post in the market, promising that government forces will not engage in looting and robbery, a recurring complaint from local people (SUNA Times, May 23). Once reduced to a few square blocks around the presidential palace, the TFG and AMISOM now control roughly 60 percent of the city. This article first appeared in the May 26, 2011 issue of the Jamestown Foundation’s Terrorism Monitor. Last weekend’s military occupation of the disputed Abyei district by the Northern Sudanese Army is the latest step in a series of armed clashes in the area that threaten to reignite hostilities between North and South Sudan in the lead-up to South Sudan’s official declaration of independence on July 9. Lying on the border of South Kordofan province (part of North Sudan) and Bahr al-Ghazal (part of South Sudan), the oil rich Abyei district is home to the Ngok Dinka and, for part of the year at least, the Arab Missiriya. The Ngok Dinka are well represented in the highest levels of the Sudan People’s Liberation Movement/Army (SPLM/A). Abyei lies atop the highly productive Muglad Basin, though some believe intensive production in this area since the 1990s has largely depleted the reserves in this area. Several important pipelines from other oil-producing regions run through Abyei. Both North and South Sudan were to have withdrawn military forces from Abyei by May 21, except for a small joint force that would continue to provide security. Yet, a battalion of roughly 200 Northern troops was attacked seven kilometers south of Abyei’s northern border during their withdrawal on May 19, leaving 22 soldiers dead and many more missing. The Northern battalion was being escorted by United Nations Mission in Sudan (UNMIS) units, which also came under attack. Northern military officials immediately blamed SPLA forces for the attack (SUNA, May 20; May 21). Khartoum responded by occupying Abyei with a force that included 15 tanks, while government aircraft were observed bombing a number of villages (Sudan Tribune, May 22). Armed looters swept through Abyei Town on May 23 without opposition, displacing nearly the entire population. While the identity of the attackers has not been confirmed, the attack on the Sudanese Armed Forces (SAF) may have been a Southern response to an incident on May 1, when an SPLA unit attempted to prevent an SAF convoy of 200 men and six land-cruisers mounted with machine-guns from entering Abyei. The SAF force opened fire, killing 11 Southern troops and three civilians (AFP, May 3). An SAF statement accused the SPLM of consolidating its military presence in Abyei since December 2010, in violation of the 2005 Comprehensive Peace Agreement (CPA) (Sudan Vision, May 23). Khartoum maintains that Abyei remains part of the North under the constitution until a referendum determines otherwise. At a rally in South Kordofan on April 27, President Omar al-Bashir affirmed this position and expressed his support for the Missiriya tribe (SUNA, April 27). Armed clashes occurred between the Missiriya and the Ngok Dinka in 2007; and, by 2008, units of the SAF were battling the SPLA for control of Abyei, destroying much of the housing and infrastructure in the process. Arbitration at the Permanent Court of Arbitration in The Hague reduced the size of the district, giving the productive Heglig oil field to the North and promising a plebiscite on the future status of Abyei to take place simultaneously with a referendum on Southern independence in January 2011. Inability to agree on whether the pastoral Missirya, who traditionally cross into Abyei with their herds for six to eight months of the year, should have the right to vote in a plebiscite on whether Abyei should join the North or South led to a postponement of the vote. The postponement was followed by renewed clashes between Ngok Dinka and Missiriya in late February/early March (for the background to the conflict in Abyei, see Terrorism Monitor Brief, October 4, 2010). UNMIS peacekeepers stationed in the region stopped patrols in Abyei after the SAF ambush, citing the danger presented by the violence (Reuters, May 23). With some 15,000 to 20,000 residents losing their possessions and homes, a spokesman for the Government of the South Sudan (GoSS) appealed to the UN peacekeepers to “come out of their bunkers” (Sudan Tribune, May 23). The UN mission’s mandate expires on July 9, when the South is scheduled to become an independent state in consequence of the January referendum. According to a state minister of the Khartoum government: “UMNIS must pack their belongings because the time has come for their departure” (Sudan Tribune, May 23). The UNMIS report on the incident failed to assign blame for the ambush, which brought an angry response from Northern officials, who said the UN’s “state of partiality and lack of clarity” would only encourage further violations of the 2005 CPA (Sudan Tribune, May 22). The United States has warned that a continuing occupation of Abyei by Northern forces would jeopardize ongoing efforts to normalize relations with Khartoum, including removal from the list of state sponsors of terrorism (Reuters, May 23). Northern officials have vowed their troops will remain in place until new security arrangements are made. Though first indications suggested that Tunisia had avoided a wave of political violence with the overthrow of Tunisian president Zine al-Abidin Ben Ali on January 14, the continuing civil war in neighboring Libya is threatening to spill over into Tunisia as operatives from al-Qaeda in the Islamic Maghreb (AQIM) seek to exploit the worsening situation. A battle between Tunisian troops aided by National Guard forces and an al-Qaeda cell on May 18 began when a member of the local security forces who was helping cell members carry their luggage after they arrived from a town close to Kasserine became concerned with the weight of their bags. He called for assistance, and when other units arrived, the militants opened fire, wounding two soldiers and killing their commander, Colonel Tahar Ayari. Two civilians were also wounded, one severely. According to several reports, the militants were carrying Libyan passports (AFP, May 18; Ennahar [Algiers], May 18; al-Arabiya, May 18). The firefight took place in Rouhia, a small town in the Siliana governorate south of Tunis. Two of the militants were killed, while others were reported to have escaped. Two suspected al-Qaeda members equipped with an explosives belt and several bombs were arrested near Ramada in southern Tunisia on May 15. Security forces said the two men, a Libyan and an Algerian, were tied to two other suspects who were carrying a homemade bomb when they were arrested a week earlier in Tatouine, 80 miles from the Libyan border (al-Arabiya, May 18; Reuters, May 15). Tunisian authorities have made a show of tightening security at the border, but continue to allow Libyan rebels to resupply in Tunisia and seek medical attention there for their wounded. However, this has not prevented Tunisia from threatening to report Libya to the UN Security Council for shelling the border region, saying that it viewed this as “belligerent behavior from the Libyan side, which had pledged more than once to prevent its forces from firing in the direction of Tunisia” (al-Jazeera, May 18; al-Masry al-Youm [Cairo], May 16). Somalia’s radical Islamist al-Shabaab movement has promised retaliation against Ugandan civilians and Ugandan troops belonging to the African Union Mission in Somalia (AMISOM). 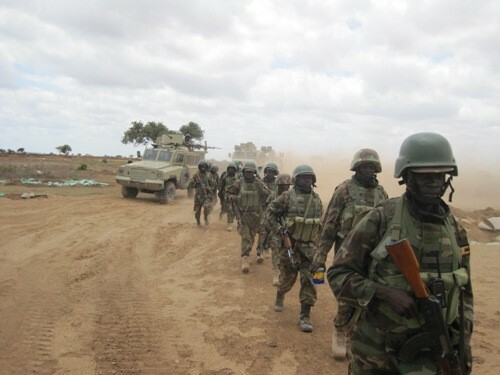 Uganda’s president, Yoweri Museveni, has led the African Union’s military effort to preserve Somalia’s ineffective and endangered Transitional Federal Government (TFG). In a May 14 statement issued by al-Shabaab’s press office and carried on jihadi websites, the movement declared the Ugandan people’s re-election of Museveni and his party for a fourth term makes the people of Uganda “unanimously complicit in the crimes of their soldiers” in Somalia and was a confirmation of their “commitment to the invasion and oppression of the innocent civilians of Somalia” (Ansar1.info, May 14). Al-Shabaab first issued threats of retaliation against Uganda for its contribution of troops to AMISOM in 2008. In July 2010, al-Shabaab terrorists succeeded in carrying out two bombings in Kampala that killed 74 civilians gathered to watch the World Cup of soccer final. The new al-Shabaab statement described the troops of the Uganda People’s Defense Force (UPDF) as “paid mercenaries fighting an endless battle on behalf of the West” for a meager salary that can barely support them. Accusing the UPDF of shelling heavily populated residential areas, markets and even hospitals, al-Shabaab promised the Ugandan people would have to repay “ounce for ounce” the blood shed by AMISOM attacks on civilians. Included in the statement was a reproduction of an identity card issued to a dead Ugandan corporal whose body is being held by the movement. Al-Shabaab fighters continue to defile the bodies of Ugandan and Burundian AMISOM soldiers killed in action by dragging them through the streets. In one such incident last week, the body was believed to belong to one of two Ugandan officers killed in a clash with al-Shabaab – Abdufita Mohammed, the commander of AMISOM forces in the Bakara market area of Mogadishu, and his intelligence officer, Abdiwahab Sheikh Dole (Daily Monitor [Kampala], May 16). Ugandan security forces may have already succeeded in interdicting a new al-Shabaab terrorist effort in Uganda by arresting four young Somali men who had entered the country illegally by crossing through the bush to avoid border control points. Only one of the men possessed a passport, with the other three claiming to have lost theirs (Daily Monitor, May 16; Reuters, May 16). Brigadier James Mugira, the Ugandan military intelligence chief, stated after the death of Osama bin Laden that Uganda continues to face other terrorist threats from the Lord’s Resistance Army (LRA) and the Allied Democratic Front (ADF) led by Jamil Mukulu, a former associate of Bin Laden during his time in Sudan in the 1990s (Daily Monitor, May 3). 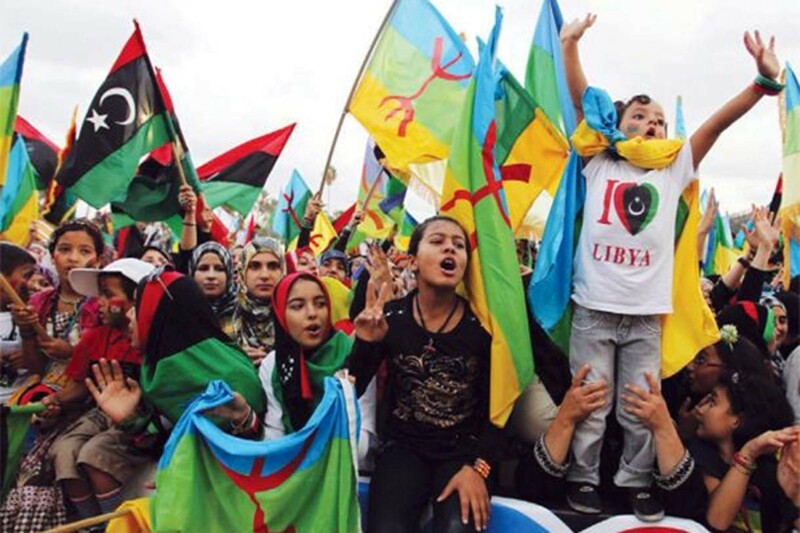 Under increasing pressure from Qaddafi loyalists, the Berbers of the Western Mountains of Libya continue to defy military odds in their resistance to a regime that has denied their very existence. According to one Berber from the mountain town of Nalut: “We have 80 per cent unemployment in Nalut, there are no good roads, no healthcare and the education system is very poor. We are fighting because for 42 years we have been oppressed” (Irish Times, April 28). Sixty miles east of Nalut is Zintan, which is currently experiencing bombardment by Grad rockets prior to an expected government advance on the town. A massive flight of Berber civilians to Tunisia is under way, with some 30,000 people having crossed the border at the small crossing point of Dehiba (UNHCR, April 29). Government spokesman Moussa Ibrahim said the regime had proof the refugee crisis was the result of a Qatar-financed campaign to have Berber rebels force family members across the border to prompt NATO air attacks on loyalist forces. Under Qaddafi’s rule, Berber language instruction in schools was banned, as were many forms of Berber cultural expression. Activists have been subject to detention, disappearance, or public execution. According to the regime, the non-Semitic Berber language is nothing but a dialect of Semitic Arabic. In June 2010 Qaddafi told a gathering of journalists and intellectuals that the Berbers were ancient North African tribes that no longer existed and it was therefore “pointless to use the language of these tribes which have disappeared.” Claims to the contrary were nothing but “colonialist propaganda” (Jana [Tripoli], June 2, 2010). Most Libyan Berbers are members of the Ibadite sect of Islam rather than the Sunni Malikite school of Islamic jurisprudence dominant elsewhere in Libya. Though many Ibadites reject the connection, the sect is largely believed to be a more moderate form of the early Islamic Kharijite movement, whose strict interpretation of Islam and advocacy of jihad to overthrow Muslim rulers accused of ignoring Islamic law led to two centuries of bitter conflict in the Islamic world. The movement’s emphasis on asceticism and egalitarianism attracted both the Bedouin and the Mawali (non-Arab converts to Islam who found themselves oppressed by Arab Muslims who considered themselves superior due to the Arab origin of Islam). However, the Kharijite injunction to rebel against any ruler who fell short of religious expectations coupled with the tendency of individuals to decide for themselves when a ruler had failed to meet these expectations was not a recipe for political stability. While the Kharijites (“Those who Secede”) were eventually eliminated and their name turned into a pejorative term for non-Orthodox Muslims, a breakaway group known as the Ibadites (for their founder Abd Allah ibn Ibad) maintained many of the core beliefs of the Kharijites while adopting a greater willingness to live in harmony with other Islamic groups. Today, Ibadites are estimated to number 1.5 million and are found mostly in Oman (1.2 million), with smaller communities in Libya, Zanzibar, the Djerba Island of Tunisia and the Mzab oases in Algeria. 1. U.S. Embassy Tripoli cable 08TRIPOLI530, July 3, 2008, published by the Telegraph, January 31, 2011. A noted Salafi-Jihadist shaykh who is regularly featured on jihadi internet sites has called for a carefully planned retaliation for the killing of late al-Qaeda leader Osama bin Laden by American Special Forces. 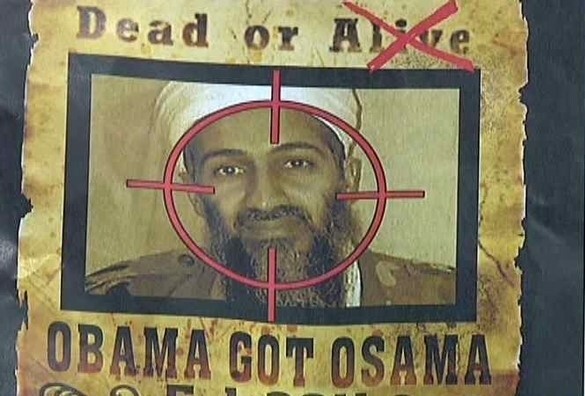 Shaykh Hussein bin Mahmud’s message, entitled “Osama is Alive!,” suggests the death of Bin Laden is actually a victory for the mujahideen in a mixture of commentary, hadiths, poetry and quotations from both the Quran and Sayyid Qutb (ansarullah.com, May 9; the message itself is dated May 3). Shaykh Hussein has also issued statements on the recent Egyptian revolution and ongoing Libyan uprising. The American version of Bin Laden’s death does not meet with the approval of the shaykh, who suggests other alternatives were more likely: If you killed him face to face, he has sped the journey of some of your troops to Hell, and if not, you struck the house from afar with your aircrafts as you did with Zarqawi, the body of whom you could not dare approach until hours after his death, may Allah have mercy on him and accept him among the martyrs.” The shaykh also mocks the United States for spending ten years and “a trillion dollars” in its efforts to find Bin Laden. Once known as “Forbidden Kufra,” the small group of oases clustered in the vast deserts of southeastern Libya has become the latest battlefield in Libya as government forces battle to retake Kufra from the rebels who seized the region over a month ago. Despite being one of the most isolated settlements on Earth, deep in the Sahara and nearly surrounded by sand seas on three sides, Kufra has now become a strategically important center for the control of Libya’s vital oil industry. On April 28 a column of 60 vehicles carrying roughly 250 loyalist fighters arrived in Kufra, taking the oasis with only light resistance from its rebel defenders before raising the green national flag over the courthouse (Reuters, April 28). Saleh Muhammad al-Zaruq, the security chief for Kufra, had announced his support for the rebel forces in early April, putting the oasis region under rebel control (al-Jazeera, April 3). According to rebel spokesmen, the loyalist forces travelled nearly 1,000 km from Sabha, a desert stronghold of Qaddafi forces surrounded by pro-regime tribes (Brnieq.com, May 3). The rebels also claimed the loyalists were accompanied by 1,500 Chadian mercenaries, though this has not been confirmed. Rebel sources tend to exaggerate numbers and the degree of foreign support for Qaddafi in order to obtain greater military support from NATO forces. Libyan state television later reported: “Libyan forces have seized full control of the town of Kufra and purified it of the armed gangs” (Reuters, April 28). The attack on Kufra came days after loyalist forces raided a remote desert oil pumping station, killing eight guards (AFP, April 25). Kufra was long held by the Teda wing of the indigenous Tubu people, whose large Tibesti-centered desert homeland covers southeastern Libya, northern Chad and eastern Niger. However, control of the oasis region was taken over by the powerful Zuwaya Arabs in 1840. This development opened Kufra to the influence of the Sanussi religious order, which moved their headquarters there in 1895 to resist attempts by the Ottoman rulers of northern Cyrenaica to bring the Sanussis under the supervision of Istanbul. 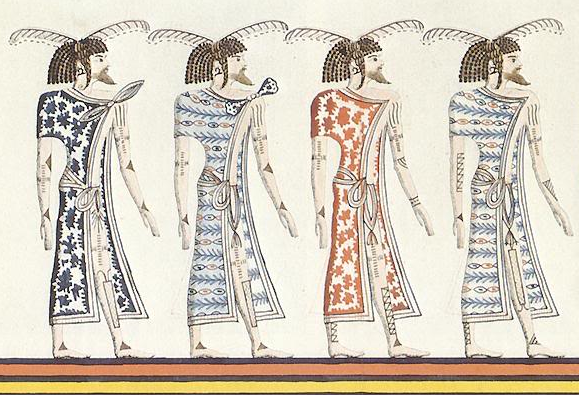 From Kufra the Sanussis expanded their growing confederacy to areas of modern-day Chad, Niger and Western Egypt, areas for which they would soon compete with the colonial armies of France, Italy and Great Britain. Though the Sanussis had lost much of their territory to the Europeans by the end of the First World War, Kufra continued to resist conquest and remained, with the exception of several prisoners and the redoubtable Rosita Forbes, closed to non-Muslims. When an Italian column under Marshal Rodolfo Graziani arrived in 1931 with 3,000 troops, artillery and a score of warplanes, Kufra’s fate was sealed. The Italians built a fort and an important airfield, but were relieved of their new possession by a column of Free French and Chadian colonial troops with the aid of the newly-formed British Long Range Desert Group (LRDG) in March 1941. The battle marked the first major victory in the distinguished military career of the operation’s commander, French General Philippe Leclerc. Kufra was then used as a base for desert operations by the LRDG and Special Air Service (SAS). In recent years Kufra has become an important center on the Libyan desert road system that has improved transportation across the Sahara and allowed food aid shipments to be driven south directly to refugee camps in Darfur and Chad (Mathaba.net, November 24, 2004). A massive agricultural project uses water drawn from the massive aquifers discovered beneath the Libyan desert. On a darker note, Kufra has also become an important mid-way point for human traffickers shipping migrants from sub-Saharan Africa north to the Mediterranean coast, where they board overcrowded boats bound for a perilous voyage to Europe. Zuwaya Arabs and Teda Tubu were reported to have clashed in Kufra in 2008, with the Teda getting the worst of it. The Libyan rebels claim to have support from the Zuwaya, but the Tubu are often seen as inclined towards Qaddafi (AFP, April 25). The Tubu have had their own problems with the Libyan leader, who expelled several thousand of them to Chad after a member of the Sanussi royal family tried to recruit Tubu mercenaries to fight Qaddafi in the early 1970s. Despite this, many Tubu find careers in the Libyan military that suit the warrior traditions of their noble clans. Under King Idriss al-Sanusi (1951-1969), the Tubu formed the royal guard. Loyalist operations in the oasis have the potential of reviving the local Arab-Tubu rivalry. This article first appeared in the May 5, 2011 issue of the Jamestown Foundation’s Terrorism Monitor. In the remote mountains that range along Libya’s western border with Tunisia, North Africa’s indigenous Berber tribes are locked in a life-and-death struggle with Mu’ammar Qaddafi’s Arab-supremacist regime. Though they were among the first to rebel against Qaddafi’s government, the Berbers are poorly armed and severely short of food and fuel with loyalist forces in the plains cutting off supply routes. Direct military intervention by NATO warplanes appears to the Berbers to be the only way of repelling advancing loyalist troops. There are an estimated 25 million Berbers (as defined by use of Berber languages) spread across North Africa. The Berbers call themselves Imazighen (“Free Men”) and their ancestors were known to their ancient Egyptian neighbors as the Libu, the Meshwesh, the Tjehenu and the Tamahu. • The Western Berbers consist of two main groups. 1) The tribes of the Ait Willul live in the coastal city of Zuwara, known in Berber as Tamurt n Wat Willul (Town of the Ait Willul). Zuwara rose in revolt in February, but government forces suppressed the rebellion there a month later. 2) The Nafusa tribes live in the Western Mountains (al-Jabal al-Gharbi), better known as the Nafusa Mountains after the region’s Berber name, Adrar n Infusen. The Nafusa Berbers retreated there from the coast to isolate themselves from the mass Arabization of the Libyans after the arrival of two large Arab tribes in the 11th century, the Banu Hilal and the Banu Salim. The Nafusa declared against Qaddafi in the earliest days of the rebellion despite having little ability to defend their communities. With the government having managed to consolidate itself in other parts of western Libya, loyalist forces have now turned their attention to the mountain rebels. • The Eastern Berbers live in the oasis towns of Jalu and Awjilah, about 250km southeast of the battlefront at Ajdabiya. 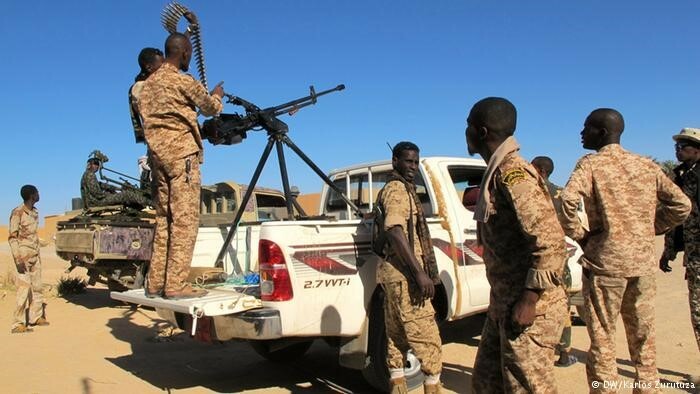 Rebel sources reported a new loyalist offensive by troops in trucks mounted with anti-aircraft guns and Grad rockets against the settlements this week, part of a government effort to cut off rebel-held northern Cyrenaica from the oil and water-rich Libyan interior. The loyalist column of 45 vehicles was destroyed in a NATO airstrike on May 1 after the column attacked Jalu and Awjilah (Reuters, May 1; Upstream Online, May 2). • The Tuareg live in communities focused on the oases of southwestern Libya. Though ethnically Berber, the Tuareg developed their own culture and version of the Berber language (Tamasheq or Tamahaq) after their ancestors migrated deep into the African interior roughly 1600 years ago. Despite insisting the Tuareg are actually Arabs, Qaddafi has also sought their favor at times due to their reputation as skilled desert fighters he could use in his efforts to expand his influence in the Sahara and Sahel regions. 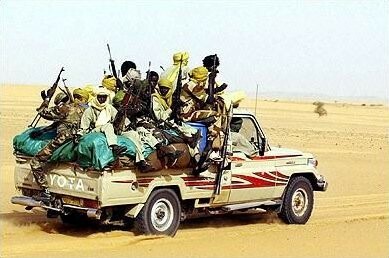 Qaddafi’s occasional efforts to champion the Tuareg cause and arm Tuareg rebel movements outside Libya appear to have brought large numbers of Tuareg from Mali and Niger to Libya to join the loyalist forces, though this recruitment has been achieved more through cash payments than personal loyalty to Qaddafi. Libya’s own Tuareg appear divided on whether to support Qaddafi, though few, if any, appear to have joined the armed rebellion. 1. 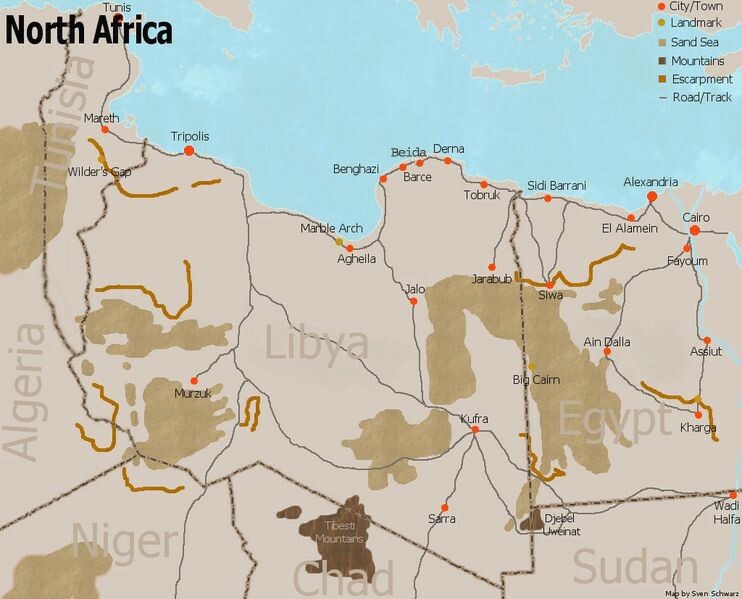 See Andrew McGregor, “Libyan Loyalists and Dissidents Vie for Tuareg Fighters,” Terrorism Monitor Brief, March 10, 2011. 2. U.S. Embassy Tripoli cable 08TRIPOLI530, July 3, 2008, published by the Telegraph, January 31, 2011. See also AFP, August 24, 2007.